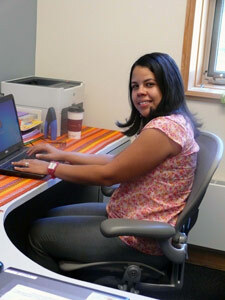 Michelle Jimenez de Tavarez is a graduate student in Kinesiology and Community Health. The Department of Kinesiology and Community Health stands out for the complexity of its research work, which not only prioritizes diversity but also focuses on all stages of human well-being—from the basic biological aspects of health issues to the real-life, practical impact on the health of the community. My graduate program has offered me the great opportunity to collaborate with professors on research, advance my knowledge, and expand my critical thinking. My most interesting experience has been collaborating with the Up Amigos research project. I have been the coordinator of the data entry process for one year. As part of the project I have attended many meetings and learned about proposal writing, paper submission, and conferences and posters preparation. This exposure has enormously improved my research skills. Currently, I am writing my first manuscript and a fellowship proposal. My main research interest is the prevention of chronic diseases. I am interested in the identification of metabolic risk factors in Latinos/Latinas and gender disparities for metabolic risk-related diseases such as diabetes and certain types of cancer. Furthermore, I am interested in communicable diseases that have characteristics of chronic conditions, such as HIV/AIDS. After completing my PhD in Community Health, I plan to return to my home country to join the Pontificia Universidad Católica Madre y Maestra (PUCMM), my Alma Matter, as a faculty member who not only teaches, but also conducts research. In addition, I plan to develop, implement, and evaluate community-based interventions that help to improve the health status of poor communities in Dominican Republic. I love spending time with my family, going to the library, and reading for my daughter Eva. I also enjoy listening to music, particularly jazz. I would recommend KCH because the graduate program ensures expert faculty, qualified staff, updated and useful courses, tailored advisory and great academic support. Surely, graduate studies in KCH are the best option for those who want to positively impact health at individual, community, and population levels.